Clarkston Ranch Estates on 3 Acres!! 4 Bedroom, 3.1 Bath, finished basement gives a total of 4650 sq ft of finished living space. This traditional floor plan has lots of storage and no wasted space! 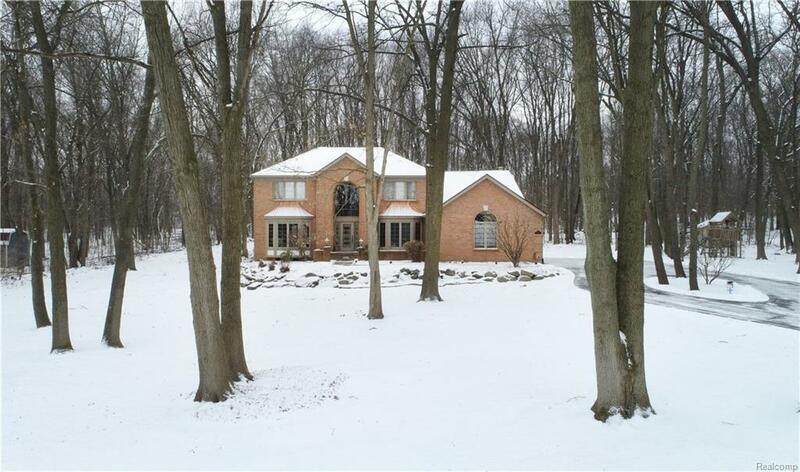 Featuring a 2 story great room with floor to ceiling fireplace and custom herringbone brickwork. The 3 seasons room looks out on your own private retreat with walking trails. The eat-in kitchen has granite, large walk-in pantry, and ample storage with maple cabinets. French doors lead to a large office with custom built-in bookshelves. Upstairs 3 large bedrooms and the master with walk-in closet, extra cedar closet and bathroom with walk-in shower and air-masseur tub. The finished basement has a possible 5th bedroom that connects to 3rd full bathroom, a kitchenette, and 600 sq ft of unfinished space includes a workshop. Over-sized 3 car garage, newer roof, mechanics, driveway, and whole house generator!! Motivated sellers!! List of upgrades and replacements included in docs.